We currently have a group buy being offered right now through Oct 26, 2014! Horsepower is addicting. Chances are, you've owned your Evo X for a while and you love everything about it. We dont blame you, it's a wonderful car. But there is one design flaw in the 4B11T powerplant that we've become aware of the longer the car has been in production, and we've got a revolutionary new product that is produced with stock frame turbo owners in mind. That is the MAPerformance Stainless Steel Manifold. Drawing from our porting and tubular exhaust manifold design experience, we've invested countless man hours into research and development of this manifold including 3D rendering, virtual flow testing, rapid prototyping, and bench testing to confirm that we have produced the best possible product for our customers. Do you know if your OEM exhaust manifold is cracked? Not many do, and it could be robbing you of power and decreasing the life of your turbo. As one of the most popular resources for ported OEM exhaust manifolds, we have seen our fair share of Evo X Manifolds. As of late, we've gotten quite a few cracked manifolds that were presumed to be in good shape. It has become incredibly hard to find a replacement OEM exhaust manifold without a crack in the collector. Yielding an astounding 22% average increase in exhaust flow over the OEM exhaust manifold and less imbalance this manifold will produce more power, something stock frame lovers are sure to appreciate. 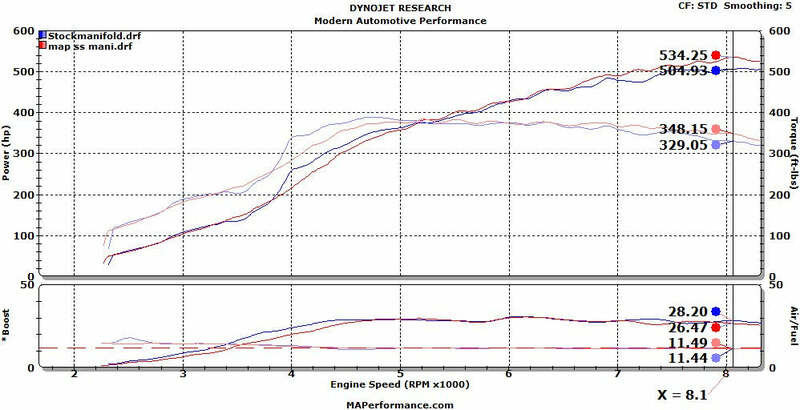 • Meticulously optimized design showing a 22% average increase in exhaust gas flow over the OEM Evo 10 exhaust manifold with less imbalance between runners. Our flow tests can verify this. • Investment Casted 310s stainless steel construction. This form of casting is stronger and cleaner than sand casting, and produces some of the smoothest runners possible. • Provisioned to allow usage of the factory heat shield. A very important feature for you stock appearing or stock frame guys and gals! • Includes two allen head bolts to ease installation of the manifold to cylinder head. • Performance. 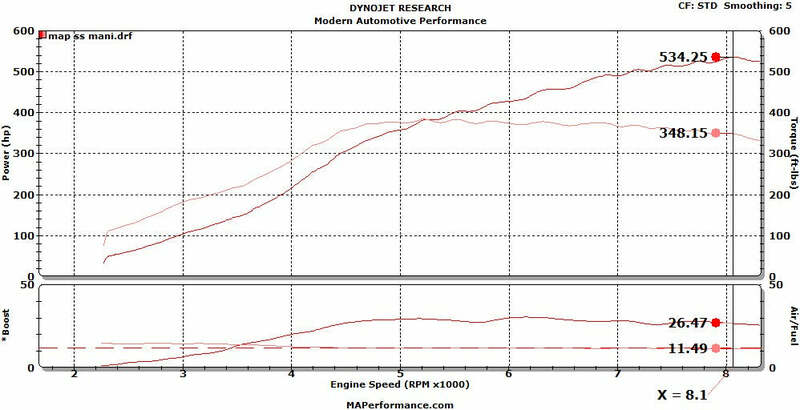 Increased exhaust flow and reduced imbalance between the runners will improve spool characteristics and produce more power. • Durability. Constructed from 310s stainless steel and investment casted to withstand cracking in the most demanding high temperature environments. • Stealth. Whether it is your own personal desire to keep your upgrades on the down low or motivation from an external source you can simply install the factory heat shield and onlookers will be none the wiser. As you can see from the below graph, the results speak for themselves, demonstrating impressive gains of up to 30hp and 16 ft lbs of torque to the wheels! Last edited by Maperformance; 03-06-2015 at 05:30 PM. Thank you! More information and pictures will be posted later today! More pictures have been added. Thanks for looking! I'm sure we are going to hear that a lot. We had some ported EVO X manifolds go out not to long ago. What's the time frame on getting these out to people? I have been very impressed with the EF2/EF3 turbos from MAP. Make awesome power and do not sacrifice spool. Great product from MAP. Depends if you're bi or homo. A Mitsubishi Evolution is like a milkshake in that it brings all the boys to your yard. Indeed, keep in mind the next 3 people to preorder get our renowned port & polish service for free!